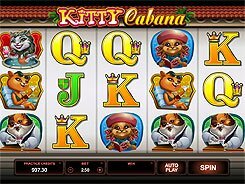 Kitty Cabana is an amazing feature-stuffed video slot from Microgaming played over 5 reels and 20 fixed paylines. 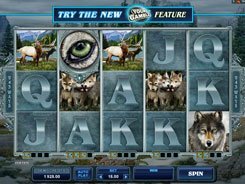 The slot has a whole array of bonus features such as Super Stacked Wilds, Wild Reels, Expanding Wilds, Frozen Wilds, Split Wilds, Dashing Wilds and free spins. 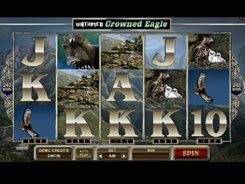 A bet size per spin ranges from $0.25 to $37.50. 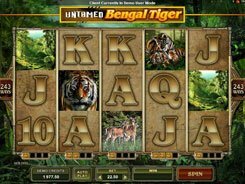 The theme of the slot revolves around cats, and its symbols, fittingly, depict animated cats drinking martini, reading or bathing in a pool; these supplemented by standard playing cards from Jack to Ace. A scatter is the biggest payer in the slot awarding up to x2500 times a total bet, or over $90,000. Three or more scatters trigger the Kitty Cabana bonus that takes you to a second screen where you must pick a door on the 1st floor to get a special bonus feature, on the 2nd floor to get a multiplier, and on the 3rd floor to find out the number of free spins. 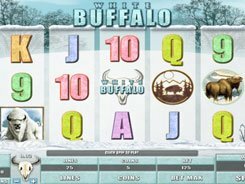 Then, during the free spins you can benefit from all the goodies mentioned before (Wild Reels, Frozen Wilds, etc.). 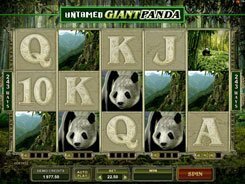 This is surely a must-play slot for everyone!